Life in Saint Paul flows deep with tradition, wide with talent and diversity, and strong with economic and cultural vitality. Our character is in our people. You can feel it in the firmness of our handshake and the warmth of our welcome. The sights, sounds and aromas are the breath of our unique, charming old neighborhoods. Saint Paul, the head of navigation of the great Mississippi River, is a City of neighborhoods. Like a network of urban villages, our neighborhoods are strong and stable, each with its own fascinating texture of historic interest, cultural landmarks, ethnic heritage and time-honored traditions. This is why people lucky enough to live here feel a remarkable sense of belonging, a sense of place. Our commitment to not only preserving, but growing this sense of the urban village is exemplified by our continuing development of Downtown. Now one of our most desirable neighborhoods, the City’s core is thriving, not just as a place to work, but as a place to live, learn and spend leisure time. We have reclaimed our riverfront, which now pulses with the energy of both concerts and commerce. Saint Paul is a thriving commercial center in our own right—home to Fortune 500 company headquarters, large regional enterprises and countless small businesses and professional firms. We are playing an ever-more-vital role in both powering and piloting the fortunes of the dynamic Minneapolis/Saint Paul Metro region. As large-scale, visionary developments like the Central Corridor (at last linking the east metro with the metro core in a way that will integrate, rather than alienate, neighborhood interests) continue to unfold, we are committed to seeing that role continue to broaden. Just as clearly as we are the seat of government for Minnesota, Saint Paul is undoubtedly the state’s historical and cultural heart. This is not just a source of great pride for those of us who live here, but it also gives Saint Paul the unique stature of belonging to every resident of the state. We recognize and welcome that responsibility. Second most populous city in Minnesota. Estimated population size is more than 300,000. Average high temperature in September in Minneapolis-Saint Paul is 71 degrees. 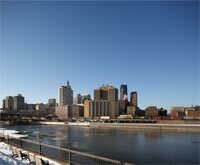 Saint Paul has more city shoreline on the Mississippi River than any other city. Home to many commercial, manufacturing, transportation, educational institutions, and non-profit organizations. More than 80 languages are spoken in Saint Paul public schools. Saint Paul's population is 64.3% White non-Hispanic, 13.4% Asian, 12.6 % African American and Pan African, 8.5% Hispanic and 1.2% American Indian. Rondo Days is a celebration that commemorates Rondo, the heart of the African American community in Saint Paul prior to the construction on interstate 94 that caused the area to disband in 1964. It is currently the largest African American festival in Minnesota. Home to elegant Summit Avenue, the longest preserved Victorian avenue in the country. In addition to being the site of the Governor’s Residence, authors F. Scott Fitzgerald and Sinclair Lewis both lived on Summit Avenue at one time.